If you could assemble a team where the stars of both yesterday and today could fill your 16-man fantasy hockey roster, which players would make the cut? Would you take Brian Leetch's 80-assist season in 1991-92 or Denis Potvin's 98-point, 100-PIM showing in 1975-1976 to round out your blue line? Would you spend your last bench spot on Jonathan Quick's brilliant 2011-12 season or elect for Gordie Howe's well-rounded 1968-69 campaign? NHL.com now turns back the clock to create a roster strategically stacked with the best statistical seasons -- by each position -- since the expansion era began in 1967. Keep in mind, this roster does not argue the top players in NHL history, but rather recognizes players with the highest fantasy hockey value based on their best individual seasons. PLEASE NOTE: This roster was constructed under the generic Yahoo! Sports fantasy hockey roster format (2 C, 2 LW, 2 RW, 4 D, 2 G, 4 BN), taking the following statistics into account: G, A, PIM, plus-minus, PPG, SOG for skaters; W, G.A.A., SV%, SO for goalies. "The Great One" is the most dominant point-producer the NHL has ever seen, and never was it more evident than in '81-82. 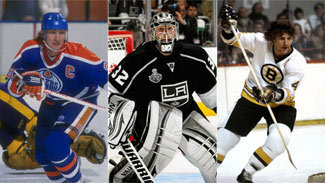 Gretzky's 92-goal showing set a League record that stands to this day, and his shot total was a personal best by 11. His point total (212) and plus/minus rating were the second-best of his career. It's probable that a level of Gretzky-like statistical prowess will never be reached again. "Super Mario" won the scoring title over Gretzky by a landslide in '88-89, displaying an unprecedented combination of points (199), PIMs and PPG. He also posted the fourth-best goal total and the fifth-best point total in League history. Seasons like this are why Lemieux is the only center in history whose name can be used in the same sentence as Gretzky. Gretzky missed nearly half of the regular season for the Kings in '92-93, but it didn't end up being a detriment to L.A. thanks to Robitaille's incredibly balanced production (125 points, 100 PIM). Robitaille put forth arguably the greatest statistical campaign at his position in history, scoring the most points ever in a single season by a left wing. Only six players in NHL history have compiled more points in a single season than LaFontaine did in '92-93 (148), but the talent historically at center and his average plus/minus rating that season left him off the roster. Finished with 129 points, 79 PIM and 13 PPG, but one can't justify taking him on this roster over Gretzky, Lemieux or Yzerman -- the three most prolific single-season point producers of all time. One of four players in League history to score 50-plus goals and add 200-plus PIMs in one season, but his minus-9 rating was the biggest reason why he missed the list. Scored the most goals ever by a LW (65) and produced the third-highest single-season shot total in history (446), but he did not produce enough PIMs to be compared to Robitaille or Stevens. Set career-highs in points (136), assists (80) and rating (plus-89), but his 56 goals and 14 PPG trail Jagr, Hull, Selanne and Bossy by comparison at RW. Howe played in the preliminary stages of the expansion era and was sound from a fantasy standpoint in every category in '68-69, but no particular area sets him apart from such a jam-packed race at RW. Tallied 18 PPG (T-2nd highest single season total ever among blueliners) and 100 PIM, but his rating and assist totals in '75-76 trail the aforementioned seasons of Leetch and MacInnis by a substantial margin. Chelios' point total in '92-93 (73) hurt his cause in comparison to the elite d-men in this roster selection, but his ability to put together the season he did while serving 282 PIM warrants an honorable mention. "The Dominator" lived up to his nickname in '97-98 with 13 shutouts and a 2.09 GAA, but his wins total (33) and GAA just don't match the other statistically prominent goalies in consideration. Won 40 times in only 62 games for Colorado with a strong GAA (2.21) and save percentage (.913), but his shutout total (4) is much lower than his competitors who made this roster. Stevens, who flanked Lemieux at LW on the Penguins' top line in '91-92, became one of four players in League history to accomplish 50-plus goals and at least 200 PIMs in one season (Gary Roberts, Brendan Shanahan and Keith Tkachuk round out the list). The diversity of his game would make him an invaluable asset as a top-six forward on this roster. Jagr remains a productive fantasy asset to this day, but his '95-96 season was one for the record books at his position. He registered the highest single-season assist and point (149) totals in history by a RW, adding nearly 100 PIM and a plus-31 rating. His lethal goal-scoring mark with the man advantage solidifies his spot on this all-time fantasy roster. Following in the footsteps of his father, Bobby Hull, Brett broke out for 86 tallies in '90-91 (most ever by a RW) to surpass Lemieux's total (85) from two seasons earlier as the third-highest output of all time. Hull had a low PIM output, but his elite shot and goal totals that season earned him a spot in the starting lineup. Of all the masterful seasons that Orr produced in his career, '70-71 proved to be the apex. He dished out the most assists and scored the most points (139) in a single season by a d-man in League history, while setting an NHL record with a plus-124 rating. His PIM total also sniffed the century mark, as Orr shined in the offensive zone unlike any other blueliner in history. Coffey -- one of the most durable blueliners in history -- registered the best season of his career in '85-86. He notched 48 goals to surpass Orr's 46-goal output in '74-75 for the highest single-season total in League history by a defenseman. He added 90 assists (T-2nd highest single-season output among d-men) to go along with 120 PIMs and a plus-61 rating. MacInnis' offensive game was in full swing in '90-91, when his 103-point mark made him the highest-scoring d-man in history not named Orr or Coffey. MacInnis collected 90 PIMs and a plus-42 rating, forming a two-man wrecking crew on the power play alongside fellow blueliner Gary Suter. MacInnis' memorable season stands as the best fantasy campaign from a post-1990 defenseman. Leetch's '91-92 season made him the only American-born defenseman in history to reach the 100-point plateau in a single season. He dished out assists galore and posted a great rating as the orchestrator of the Rangers' offense. While his PIM output that season was slim, his on-ice vision and unselfishness made him one of the top point-generating blueliners of all time. Brodeur set a record for the highest single-season wins total of all-time, and his compilation of only 23 regulation losses in 78 games is simply incredible. Fantasy owners savored each of his 12 shutouts, while his goals-against-average frustrated opponents on a nightly basis. Brodeur played in all but four games that season -- a campaign that will live on for many years to come. Captured a then-record 47 wins, dropping only 13 contests in that span en route to winning the Vezina Trophy. Save percentage was not a statistic during his days, but his stingy GAA provides more than enough evidence of his sheer dominance. Parent's wins mark has since been passed by Brodeur, but his earth-shattering numbers that season were unprecedented at that stage of the expansion era. Because of his position and elite company on this roster, Yzerman barely missed out on the starting lineup. But his tremendous campaign in '88-89 speaks for itself in every category. What's not to like, fantasy-wise, about this all-time great season of 65 goals, 90 assists, and nearly 400 shots on goal? Selanne, whose NHL career has spanned three decades, used the greatest rookie campaign of all time to show the world he would be one of the game's best for a long time. His 76 goals and 132 points are by far the most ever by a rookie skater, and his 45 PIMs proved to be another strong element of his first season at the NHL level. His lofty totals in '92-93 will probably never be matched again by a first-year player. Only two goalies since the start of the expansion era (Brodeur in '97-98 and Parent in '73-74) have posted better single-season goals-against averages with 69-plus appearances than Quick's G.A.A. in '11-12. The Cup champion Kings had the second-worst goal-scoring offense in the League this past regular season, but that didn't prevent Quick from posting 35 wins (T-5th in NHL) and a League-best 10 shutouts. Bossy was the offensive sparkplug of the Islanders' dynasty, scoring 100-plus points in seven of his 10 NHL seasons. While he set a career-high with 69 goals and added 27 PPG in '78-79, his '81-82 campaign saw him emerge as one of the most unstoppable point-producers in League history. Bossy's plus/minus rating was a career-best, while his totals of 147 points and 83 assists trail only Jagr among RWs historically.